Born on the South Side of Chicago in 1964, Michelle Obama grew up watching the shifting demographics of her neighborhood and her father’s health decline slowly. A gifted student, she left her home city for the halls of Princeton and Harvard, where she studied law and witnessed stark divides based on class and race. And as a young lawyer at a prestigious firm, she recalls the fateful day when a new law intern named Barack showed up (irresponsibly late) and upended her carefully planned life. Filled with candid moments from the campaign trail and the East Wing of the White House, Becoming allows readers to glimpse the reality of living in the harsh glare of the public eye. 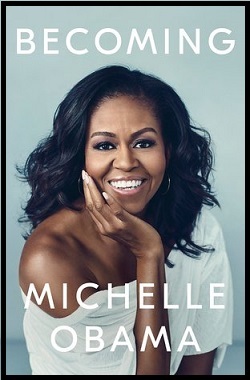 Despite the unending criticism and scrutiny she withstood during her husband’s eight years in the Oval Office, Michelle Obama never shies away from laying out the details of her life. Becoming is a memoir, but it is also so much more. It’s a family history, a remarkably honest love story, and a chronicle of the many small and large choices one woman — like so many women — must make between her family obligations and her own aspirations. Michelle Obama is an American lawyer, nonprofit administrator, writer, and former First Lady of the United States. Born and raised in Chicago, Illinois, she holds degrees from Princeton University and Harvard University, and has worked for both the University of Chicago and the Chicago city government. As First Lady, she championed issues critical to children’s health through her Let’s Move! campaign. Her published works include Becoming and American Grown: The Story of the White House Kitchen Garden and Gardens Across America.